From Junction 17, M25 - Take the A405 towards Rickmansworth town centre. At the first roundabout take the first left (Uxbridge Road A412). At the next roundabout take the first right into Riverside Drive (A404). At the next roundabout take the first left into Church Street. Continue past the Church and as you come round the bend past the Feathers public house take the first right into Norfolk Road. 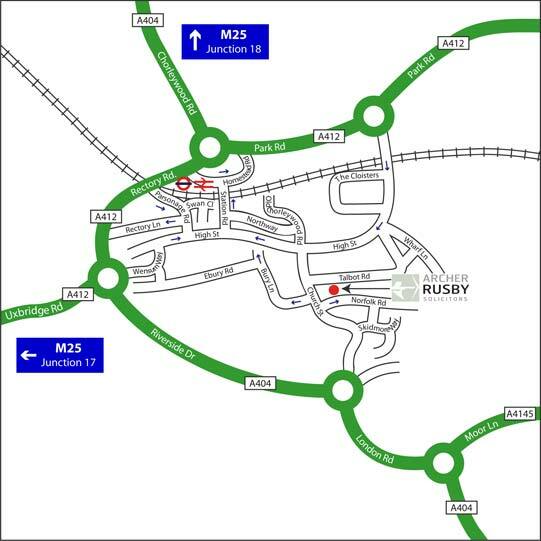 We are situated on the left hand side just past the red brick offices of Bugler Homes. From Junction 18, M25 - Take the Chorleywood Road towards Rickmansworth town centre. At the roundabout take the 2nd exit into Rectory Road and pass under the Railway bridge proceeding until you reach the next roundabout where you take the 2nd exit into Riverside Drive. Then please follow details as above. From Heathrow Airport - Take the M4/M25 north, coming off at junction 17, and follow the signs for the town centre. The total journey is 16 miles. From Gatwick Airport - Take the M25 towards Heathrow, continuing to juntion 17, and then follow the signs for the town centre. The total journey is 42 miles. From Luton Airport - Take the M1 south, then the M25 towards Heathrow/M4, but come off at junction 18 and follow signs for the town centre. The total journey is 20 miles. Parking is available on site. Please collect a permit on arrival. Main line train services operate from London''s Marylebone station to Rickmansworth. Journey time from Marylebone 27 minutes. Underground services to Rickmansworth rail station are available on the Metropolitan Line from Baker Street. Journey time from Baker Street 29 minutes.